In 1995, President Clinton declassified 800,000 photographs from CORONA, the United States’ first spy satellite program, in order to make them available for environmental and historical research. Since then, imagery from the U2 aerial missions and from HEXAGON, the CORONA successor, have been declassified as well. Archaeologists working in the Near East have been quick to embrace these newly available resource, which capture images of sites and landscapes in the 1960’s. Many of these landscapes have been damaged or destroyed in the intervening 40 years. 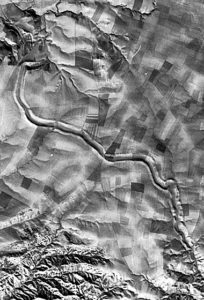 This presentation will discuss how CORONA imagery has been used to study ancient landscapes in the Near East, with case studies from Bronze Age Syria, Iron Age northern Iraq, and late Antique northwestern Iran. 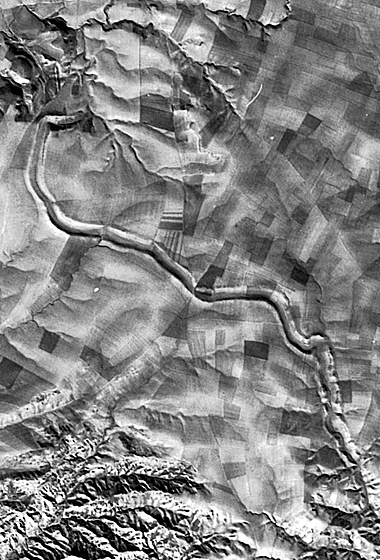 1969 Corona spy satellite view of an ancient canal north of Nineveh (modern Iraq), courtesy U.S. Geological Survey. Is an RSVP required? Also, is it possible to bring a fellow student with me to this event [I am an AIA member; they are an ASOR member]? All our lectures are free to the public, no RSVP required. I presume your are a college student, perhaps graduate if an ASOR member. Are you a member of the AIA Westchester Society? I don’t see that email address listed on our membership lists or enewsletter list. Perhaps you are a member of another society. In any event you and your fellow student are welcome and with your permission, I can add you to our monthly email list. I am a member of the AIA and a student. I would like to bring my boyfriend who is a student and a member of ASOR. I would love to receive the monthly newsletter! Thank you. You already are on the distribution list for newsletter. No reservations are required to attend our lectures. 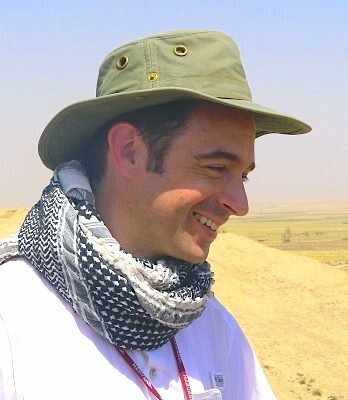 The speaker Saturday is the co-editor of BASOR so as an ASOR member you should be sure to meet him.